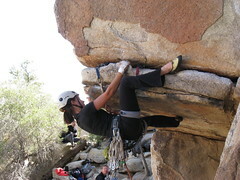 Joshua Tree got groped by Jason, Marcela and me last weekend. Temps were a tad on the chilly side, around 40-ish, and the wind brought some ferociousness. Marcela’s tent got shredded the first night, but fortunately it snowed the next evening. My companions weren’t super psyched. I got on Desert Shield and a couple head pieces I want to lead but whose names I forgot. Desert Shield is great. I think I can redpoint that sucker pretty quick. It’s kinda crimpy but steep with long moves so a send should come together after a day or two, I would think. How appropriate. Halloween and death slabs are a match made in Hell. 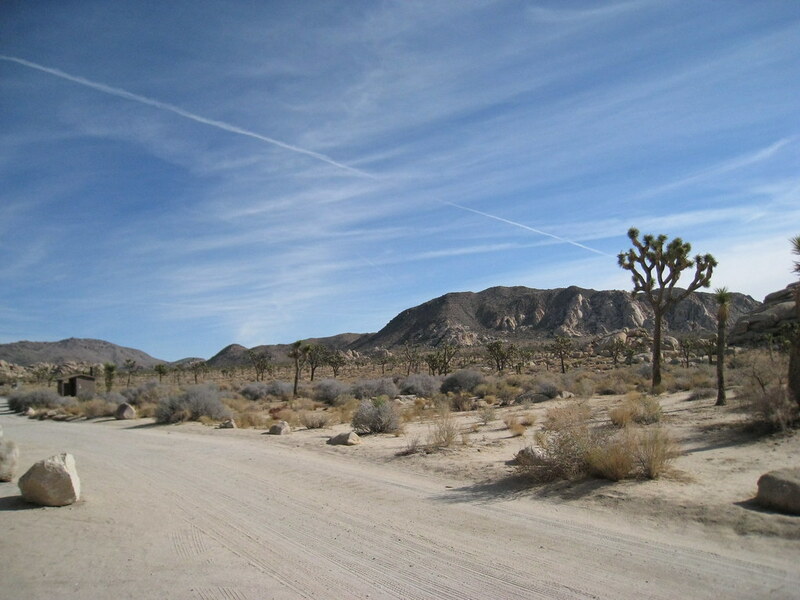 Yeah, there’s plenty of trick-or-treating in Joshua Tree, stacks of routes to trick you in to running them out until you’re treated to a near death experience. It’s growing on me. 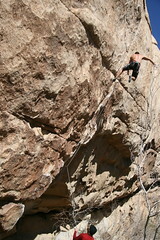 I got on this 12d, La Cholla, and had seriously a bunch of fun. 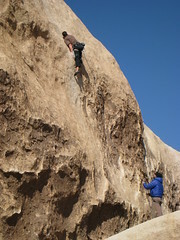 It’s a slab problem to a near vertical, maybe a touch more, face route. It’s well protected, got some awesome moves, and I think I’d like to project it. Not my typical fare, obviously, but an interesting climb no doubt. I like Joshua Tree. Who knew? 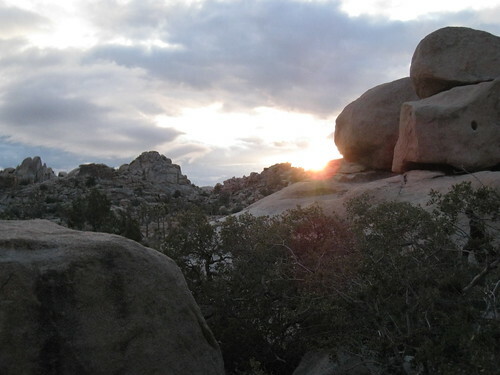 Gritty, crumbling granite slabs in the high desert of inland California… sounds like hell, right? In some ways it is. There’s just something about the bold leads, perpetually good weather, infinite rock and gnarled old-school locals that make the park characteristically classic. My formative climbing years were spent in Seattle gyms, sport redpointing at Smith Rock, bouldering at Squamish, and now, Owl Tor. 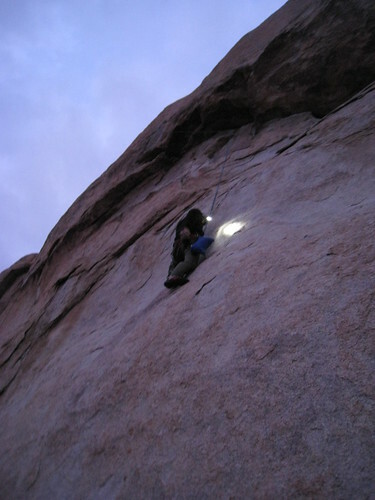 Though classic in their own right, and destination worthy no doubt, neither Squamish nor Smith are representative of traditional American climbing like Joshua Tree. 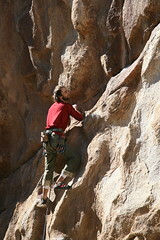 And I’m ordinarily not one to romanticize climbing’s history in the States. In fact, it’s really only the new generation of steep, powerful, pocketed lines that interest me, the exact opposite of Joshua Tree’s low-angle style. 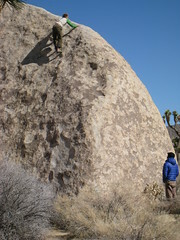 But I think it’s been good for me to work out a new technique, the kind of friction intensive skill requisite on J-Tree’s runout slabs. These runouts really are changing my climbing. Having to stick to the rock as if your health depends on it, because in fact it does, is common here – not something I’m used to, so it has to be good. The weather was sunny and cold – maybe 60s during the day and 40s at night. Cold is good. If I had not been nursing a cold I like to think I would have climbed hard. I did not. Puss ‘n Boots (5.11c) was the most significant thing I got on. About 10 degrees off vertical, thin and a little spicy up top, she got too heady for me at the end. I’d like to finish what I started here, maybe in a couple weeks. I spent the Memorial Day weekend at Joshua Tree. It was good. 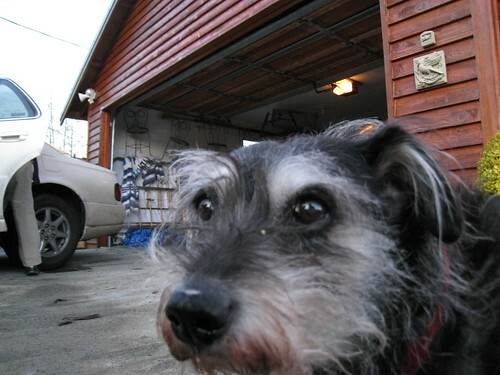 The weather was unseasonably cool, making conditions unusually comfortable. It’s been like 12 years since I was in the park. 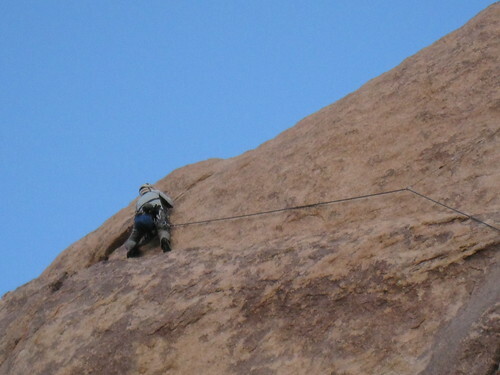 The group was a bunch of trad climbers… and me. I don’t trad climb. Ever. I think it’s stupid. But whatever, I gave it another chance. And had fun in the sense that walks on the beach are fun. The trip in general was super rad cuz everyone I met was cool and the park is great. On one hand, it was nice of them to put up these routes. On the other hand, redpointing is way harder when I’m crying. Had my cell phone been with me and had there been reception, which it wasn’t and there isn’t, I probably would have called my mommy in the middle of one 5.9. Three bolts in 50 feet of hell slab is pushing it. Deb, Marcela, and me trad climbing. 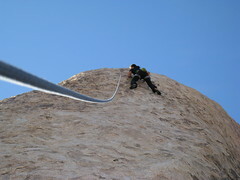 That’s right, TRAD climbing.